Benefit from extra tasks, such window painting, refinishing, and more. What goes into the actual repair of wooden window frames? Remove any dust and rot from the wooden surfaces. Treat the affected area with professional wood filler. Replace damaged wooden window sill or frame sections (if necessary). Leave the working area spotless and collect all leftover timber. It does not matter if you have wooden sills of yore or ones that are a mere decade old. Aged or not, the seasoned experts have mastered a variety of restoration techniques to safely bring your windows to their former glory, while leaving their unique style completely untouched. Besides repairing rotten wooden window frames or sills, the specialists can also add several coats of oil or paint your wooden textures in bright, inviting colours, changing the entire look and feel of your home. Once the job is done, the neighbouring homes won’t hold a candle to yours! 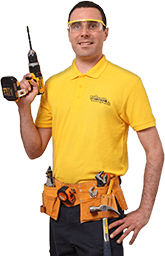 The trained professionals will carry all equipment needed to repair your wooden window frames or sills from start to finish. For instance, the practiced handyman can carry anything from chisels, filler knifes, and wood fillers, to ladders, various grades of sandpaper, and primer, undercoat, or topcoat paints straight to your home. And with these tools in hand, the specialists will have no trouble fixing or replacing even the most weathered window segment fast and without making a ruckus – something that your neighbours will surely appreciate. There’s no need to switch to uPVC just yet. You can schedule a wood window frame repair session or receive a free quote as soon as you need one – our online booking form, instant website chat, and phone lines are readily at your disposal 24 hours a day, 7 days a week. Simply tell us the type of windows you have, whether they’re internal or external, and how high they’re located. Once our knowledgeable advisers review your information, they will gladly send a team over to deny winter a chance to ever sneak into your home!